A stroke is a serious medical condition caused the lack of blood supply to the brain. In most cases, it is caused when a blood clot forms in an artery that supplies the brain, a condition commonly referred to as an ischemic stroke. 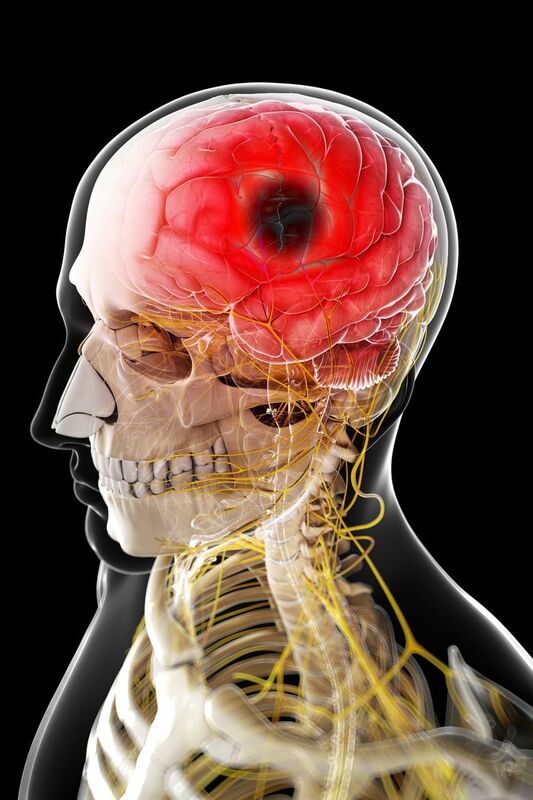 However, in around 10 percent of cases, a stroke is caused when a blood vessel suddenly bursts in the brain. Without the oxygen carried by blood, brain cells can quickly die and lead to permanent brain damage. This type of stroke is referred to as either a hemorrhagic stroke or an intracranial hemorrhage. A non-traumatic intracerebral hemorrhage is a devastating event with a 30-day mortality rate of between 35 percent and 52 percent, according to a 2010 study in Stroke Magazine. While an intracranial hemorrhage may occur as a result of a severe head injury (such as might occur in a car accident), the two most common causes are related to abnormalities of the blood vessels themselves. One such condition is known as an aneurysm which occurs when a section of an artery becomes abnormally enlarged. When this happens, the walls of the artery may begin to balloon and eventually rupture. Aneurysms may be congenital (meaning that there were there from the time of birth) or be caused by chronic hypertension (high blood pressure). Another less common cause is a congenital disorder known as an arteriovenous malformation (AVM). AVM is characterized by the absence of capillaries between arteries and veins. Instead of connecting through this branching network of tiny vessels, certain arteries and veins will connect directly. This most typically occurs in the brain or spine. Over time, the abnormal vessels will begin to dilate as the blood pressure places an added strain on their already weakened structure. Sadly, more than 50 percent of people with an AVM will experience a hemorrhagic stroke. In addition, certain types of brain cancer can cause an intracranial hemorrhage by undermining the structural integrity of a vessel and weakening it to the point of bursting. One of the first steps to dealing with an intracranial hemorrhage is to reduce the blood pressure as quickly as possible. Intravenous antihypertensive drugs are standardly used for this, while medications may also be prescribed to counteract any blood thinners the person may be taking. Once the individual has been stabilized, the doctors will aim to pinpoint the source of the bleeding. If the hemorrhage is relatively small, supportive care may be all that is needed, including monitored hydration with IV fluids to prevent intracranial swelling. For more serious strokes, surgery may be needed to repair the rupture and stop the bleeding. In other cases, it may be used to alleviate pressure from the accumulated blood. This may require a procedure known as a craniotomy in which a section of the skull is temporarily removed. Typically speaking, recovery from a hemorrhagic stroke is slow and requires a prolonged hospital stay. Occupational, speech, and physical therapy may also be needed to improve motor skills affected by brain damage. In the case of a minor stroke, a person may be able to return home in a couple of weeks. In more severe cases, treatment may be on-going and require long-term care if the motor and cognitive functions have been significantly impaired. American Heart Association. "What Is an Arteriovenous Malformation (AVM)?" Dallas, Texas; updated October 2012. Hanley, D.; Awad, I.; Vespa, P. et al. "Hemorrhagic Stroke: Introduction." Stroke. 2013; 44: S65-S66. DOI: ​10.1161/STROKEAHA.113.000856. Powers, W. "Intracerebral Hemorrhage and Head Trauma; Common Effects and Common Mechanisms of Injury." Stroke. 2010; 41: S107-S110. DOI: 10.1161/STROKEAHA.110.595058. An ischemic stroke is classified as either embolic or thrombotic. Do You Know This Exact Definition of a Stroke? What Is an Acute (or Sudden) Stroke?